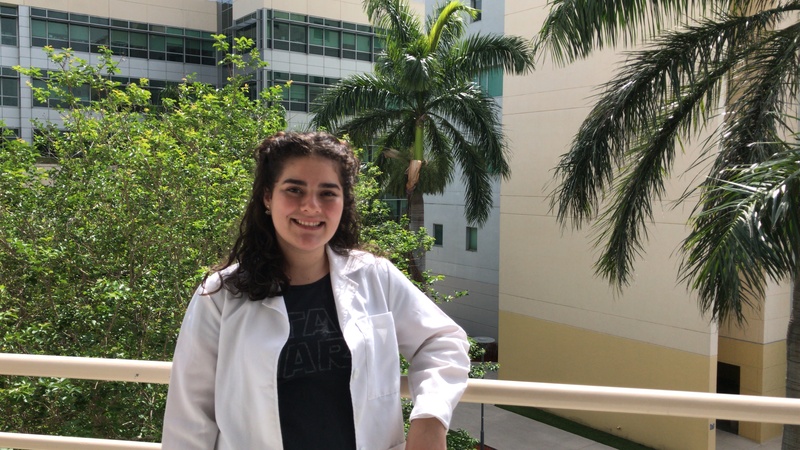 At the age of 20, Paloma Tuttle-Vasseur is headed to Harvard with her FIU bachelor’s degree in Chemistry and a National Science Foundation Graduate Research Fellowship. “I’m so humbled to join a program that values in a scientist the qualities of integrity and compassion as much as intelligence and ambition,” Tuttle-Vasseur said. She is one of four who have earned their bachelor’s degrees at FIU to receive the award this year. Biology graduate Aneysis Gonzalez ‘14 is currently a graduate student at Yale. Chemistry graduate Jocelyn Nardo ‘15 is a graduate student at Purdue University. And Chemistry graduate Tayliz Rodriguez ‘17 is a graduate student at the University of North Carolina at Chapel Hill. A fifth student receiving the coveted NSF fellowship, Vierelina Fernandez, recently graduated from DePaul University and will be headed to FIU this fall to study International Relations. Tuttle-Vasseur is a Miami-native and daughter of two FIU alumni. Her parents met as peer advisors in the 1980s. As a child, the FIU campus was like a second home for Tuttle-Vasseur who first enrolled at the university as a dual enrollment student in high school. As a Chemistry major, she studied organic chemistry applications in biology. One aspect of her studies focused on cancer treatments. She has plans to continue her chemical biology research as a Ph.D. student at Harvard with the help of the NSF fellowship. The NSF Graduate Research Fellowship Program supports graduate students in science, technology, engineering and math. Fellows receive a three-year annual stipend of $34,000 and a $12,000 for tuition and fees. They will also receive international research and professional development opportunities. More than 12,000 students applied for fellowships this year and 2,000 were awarded.